AAAP Mtg. January 9, 2014, 7:30 PM – 9 PM, Carnegie Science Center, Bayer Stage. The feature presentation is a talk by Mr. Eric Fischer: “Where have all the astronauts gone?”. Learn about the current status of the U.S. manned space program. 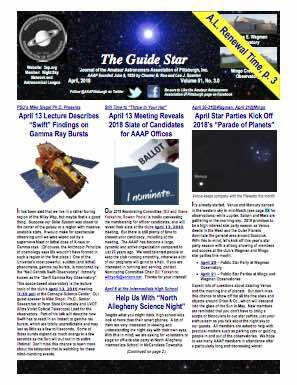 Plus, discussion of the past month’s observations, upcoming events, recent astro-photos, and more! https://3ap.org/wp-content/uploads/2018/08/logo_web_2018-300x300.jpg 0 0 DeSantisK https://3ap.org/wp-content/uploads/2018/08/logo_web_2018-300x300.jpg DeSantisK2015-01-07 08:27:542015-01-11 19:32:31AAAP Mtg. January 9, 2014, 7:30 PM - 9 PM, Carnegie Science Center, Bayer Stage. Since drilling near AAAP observatories is a concern, Range Resources has this presentation that provides information about their processes. Additional details and the application packet can be found here.